Hannah from the UK team, and Yu from the Japan team spent the afternoon with descendants of a genuine Ninja clan in Tokyo. Not knowing what to expect from the experience, both were in for a real treat, and an unforgettable afternoon! Arriving at the well-hidden location for our afternoon with the Musashi Ninja clan, experience leader and ninja Vanessa greeted us. Wearing head-to-toe in black, she welcomed us to the dojo where training with descendants of a genuine Ninja clan, known as the Musashi Clan, takes place. The Musashi Clan comprises families and individuals who have connections to the Shibatas, a group of samurai warriors who devised and created weapons and tools, and trained their servants to act stealthily. The Shibata served the shogunate for 265 years before becoming independent. 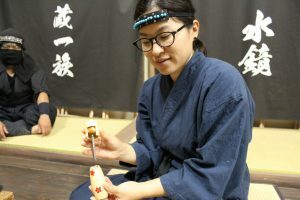 Those now involved in the Musashi clan aim to share this particular part of Japanese culture with the world, through seminars, workshops and hands-on experiences. Today Ninja would correspond to the role of a “secret agent,” and they trained in the art of nin-jitsu, which involves meditation. To begin our experience, we entered a completely dark room. 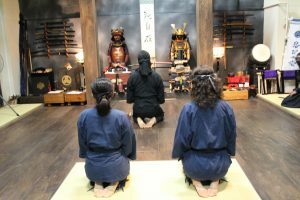 We were promptly instructed to remove our shoes, leave our belongings, and kneel in the centre of the tatami-floor space. As Vanessa lit some candles, it became clear we were in the presence of two other ninja. They suddenly sprang into life as they silently moved around the dojo. Next, we participated in a ritual, showing respect to the ancestors of this ninja clan, before the lights came up and we were formally introduced to the two ninjas present. We then changed into ninja attire (ninjas actually used to wear navy blue, not black as the Hollywood films would have us believe), before beginning our own Ninja training. Over the next two hours, we practised how to move and think as ninjas do. We learnt to control both our bodies and minds, as well as learning about the history of ninjas in Japan. Although both the ninjas spoke Japanese, Vanessa expertly translated throughout to give us a completely seamless experience. It’s difficult to divulge too much about this wonderful experience without spoiling the surprise! In short, any guests who choose to partake in the Ninja Experience are certainly in for a real treat! The Musashi clan can tailor the programme to meet individual needs. For families, the chance to learn how to jump over obstacles silently, and throw a shuriken, gives a great feeling of achievement. 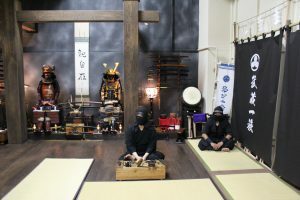 For those more interested in the history of ninja in Japan, there’s a less active version of the programme. Instead, there’s more opportunity to watch the ninjas display their skills, and ask questions about training and ancestors. A real highlight of the experience is certainly the introduction to Ninja weapons. We were shown eight different types of weapon which were commonly used. After a short demonstration of each, we were allowed to hold them for ourselves. The whole afternoon was a brilliant mixture of history and activity. Ninja experience provides rare insight into a fascinating world: we both came away full of energy and excitement after this completely unique active. It’s a real must for a trip to Japan like no other! Recommended for: Families (minimum age of 7 when accompanied by an adult), and anyone looking to add something completely unique to their time in Tokyo!